You must have had some wonderful horses over the years. Which horse would you pick out as your favourite? DS: This was definitely my stallion Van Deyk, who died at the age of 34 this spring. He was a half full-blood Trakehner, bred by my parents and he never left our stable. Van Deyk was my first Grand Prix horse. He trained me as much as I trained him, and was always the ‘chief’ in our barn. Even after a hazardous fire in 1996, when he lost more than 40% of his skin, he recovered and fought back in sports. 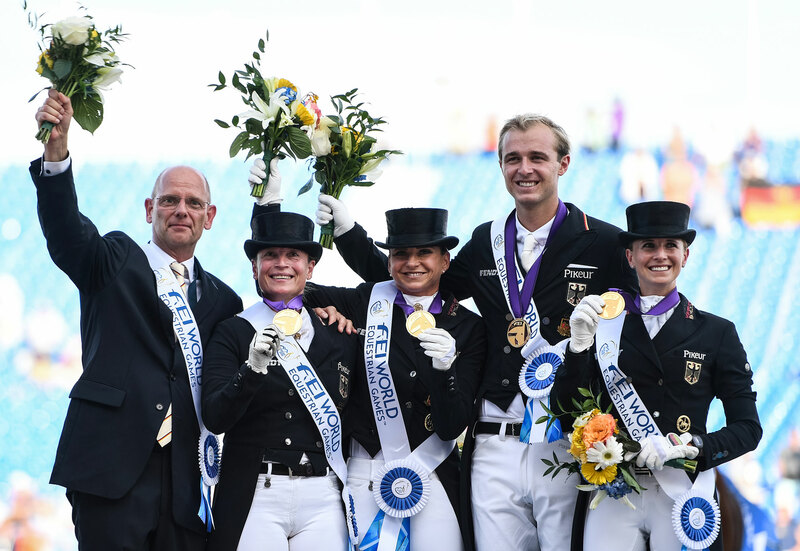 What is your greatest ever experience in Dressage and why? DS: If you focus on sports it would definitely be the two Olympics, because it’s the dream of every athlete. In the daily work with the horses I love those moments when the horse accepts and works with me on the next development steps. No matter which horse it is. What has been the toughest experience of your career? DS: For me it was, when my father sold my best and only competition horse. In the first moment I thought my dream of getting an excellent athlete was over. But after a short while I focused myself on my strength of developing horses and started with the next one. What's the best thing about Dressage? DS: In Dressage you need to have a symbiotic relationship with the horse. Only the entity between horse and rider will relate to the final success and satisfaction. I love this challenge of two creatures. You need to have a symbiotic relationship with the horse. It’s a home Grand Prix in Stuttgart this weekend. Tell us about your hopes for the rest of the indoor season? DS: The big targets are qualification for the WC Finals in April and for making the team for the European Chapionships in Rotterdam. However, the most important matter is the health of my horses, my team and me. Most of the horses get a rest from competitions towards the end of the year, but get prepared for the next level over the winter. Before having a small variety of Grand Prix Horses and participating at the WC Qualifier or different indoor shows also the GP Horses got a little break from competition. Due to my current situation the number of competitions per horse and year stays the same, but they are spread over the whole year.